We headed to Carvel after dinner one night, but they were closed. So we drove a few blocks and found a plaza with a Baskin Robbins and a DIY Yogurt. 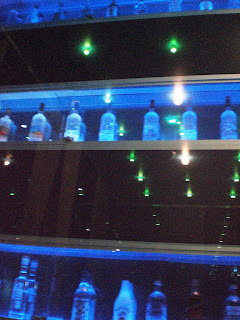 It was a very cool place, and a concept that I was unfamiliar with. Basically, you take a cup and add your own frozen yogurt and toppings. They had about 10 flavors of yogurt, including chocolate, vanilla, strawberry, cappuccino, taro, tart, mango, and a few others. There were over fifty topping options, including a bunch of cereals and candies, four syrups, and probably ten fruits. When you're finished they charge you 33 cents per ounce, and put it on a scale. There's a "weight of the day" and if it matches, yours is free. The weight yesterday was 0.88 oz, and I came closest with 0.83. I tried vanilla, cappuccino, strawberry, and tart. I added brownie bits, oreos, and strawberries. The strawberries were delicious, and the oreos were a good crushed size. The brownie bits left something to be desired (they weren't "fudgy" or fresh). Tart froyo tastes like yogurt, and I had to mix it with the strawberry for it to be palatable. The strawberry was delicious and strong. Tee cappuccino was too strong, I had to swirl it with the vanilla, which was that "country vanilla" style. As a whole, the place was good and I'd go back. BUT, since this is a typical set-up out here, I'd love to try another fro-yo place, as this one has pretty poor reviews on yelp in comparison. Tapas, for those who may not know, are like appetizers. Very common in Spain and similar cultures. There's a great tapas place in Orlando (Cafe Tu Tu Tango), and although we've only been once, we know a lot about tapas in culture thanks to one of our Spanish teachers in high school. She incorporated a lot about living in Spain and Costa Rica into the course, and we even know the hand gesture for "check, please," LoL. So when Kathy suggested we go for Japanese tapas, Jonathan and I were on board! 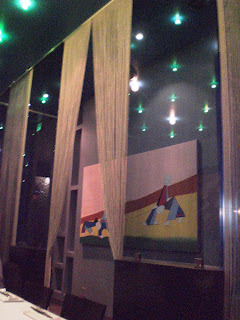 We drove into Cupertino (about ten minutes away from the apartment) and in the back of a plaza was GocHi, a Japanese Fusion tapas place. GocHi is short for "gochisou," meaning "treat or delicious hearty meal." 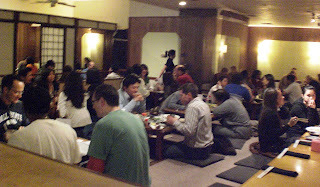 It was packed for 8:30pm on a Wednesday night, and we waited a few minutes for a table. 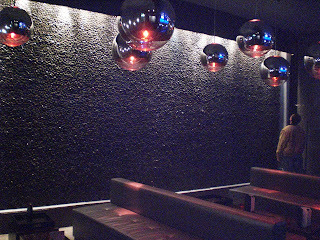 At first I was very excited, as many of the tables are a more traditional (sit on the floor" style, where shoes are removed and placed in a cubby before entering the seating area. However, we were given a "standard" table, one side was a bench against the wall and the other was chairs. We ordered five dishes and split them all. First out was one of the daily specials (I don't remember the name), which was deep-friend salmon with potato cream and tartar sauce, described as a croquette, but served like a roll as sushi. I didn't care for it, tasted too much like tempura (which I loathe). The potato cream was tasty, but as a whole I wouldn't order it again. Both Jonathan and Kathy enjoyed it. Then came the Sake Cream Cheese Miso Fushion Pizza. It had salmon and roe, scallions and cheese. It also had mushrooms which were not listed in the menu. I only had one piece, I just couldn't stomach it. The crust was light and crispy and the cheese was delicious and not oily, but it was large roe (probably about a centimeter in diameter), and it grossed me out. I tried eating around it, but I also didn't really care for salmon on pizza. I'd go as far as to say that I wish the salmon was smoked instead of baked, it might have helped. The other two liked it, but JB also pushed off the roe. The shiromaguro tataki came after that, which was seared albacore in garlic oil with little chips of garlic. The garlic chips were not very flavorful, but the albacore was pretty good. (Tataki means seared on the outside and raw in the middle). We probably ate this dish the quickest. Then was the duck steaks in a sweet, thick brown sauce. They were my favorite dish of the evening, and I thought the sauce was great. The meat was a little fatty for duck, but half of the slices were gristle-free. Jonathan didn't like the duck but thought the sauce was good. Last was a vermicelli noodle dish with cod (although none of us could taste it) and seaweed. With some cayenne pepper sprinkled on it, it was good. Otherwise it was a bit flavorless. It wasn't anything special, but it was recommended by the server, and nothing worth complaining about. Overall, it was an interesting place, and the menu is very extensive. However, I don't think I'm very likely to return. Tapas are not a cheap meal anywhere, so they need to be delicious in my opinion. Jonathan and I have been looking forward to trying a full dim sum meal for some time now, as we love the small selection that can be found in certain restaurants in Florida. We've been twice since living in California. Andy and Jim, and Jim's girlfriend Vivian invited us to a dim sum lunch in downtown Mountain View the first time, and we went with just Andy the second time. Both times we went to Fu Lam Mum, which is on the north side of downtown. The place is two stories, but uses a gigantic atrium with only a handful of tables upstairs, when it might have been smarter to have a smaller atrium and more upstairs seating. The three of us shared dishes, which was easy to do since there were appetizer plates on the table when we sat down. We ordered the Traditional Roll to start with, which was a spring roll filled with poached pork and shrimp, rice noodles, green apple, cilantro, mint, cucumber, and shallots. There was no soy sauce provided, but Kathy and JB both enjoyed the peanut sauce with the roll. Then we had the Ahi Tuna Tartare, which was served as a cerviche/guacamole dip with wonton chips. It was made from ahi tuna, cucumber, avocado, mango, green apple, scallions, and some kind of herbs. 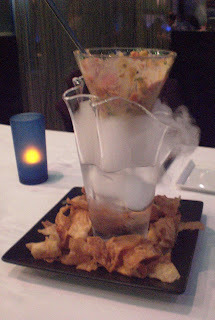 It was mixed in front of us, and set in a vase of dry ice (see the photo!). I loved the concept, but the rush of flavors was a bit strange, and the cucumber was not chopped finely enough. We want to give it a try at home, but we'll probably alter the dish a little, especially since our Magic Bullet is sitting at the house in Melbourne. Then we got a dish of glass noodles with dungeness crab that included scallions and fried shallots as well. I didn't try any, as the crab was shredded and I couldn't eat around it. Both of the others enjoyed it, and Kathy mentioned it is one of her favorite dishes at the place. Finally, we had the Peppercorn Beef, which was filet minion over potatoes, asparagus, and bell peppers, all in a decently-flavorful peppercorn sauce. The beef itself was quite good, although the potatoes were horribly unflavored... they could have used a spice rub in addition to the sauce. It was the priciest dish, but then again it was filet minion. We really had no specific hankerings for dinner, so we just walked downtown and let our noses be the guide. We were between a Thai place and an Italian place, and Thai won. 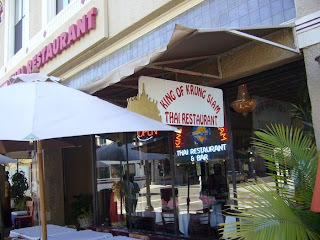 King of Krung Siam was the name of the place, and it was decently crowded. We were sat immediately (it was a little after 8pm), and water was served. I had only read through the appetizers and salads when the waiter came to take our order, so we had to ask for a few more minutes. The entrees spanned several pages, so I flipped through to see the categories. I read through noodles and rice dishes and hadn't even gotten to three pages of options when the waiter came around again. Now, those who know me well know that I read the entire menu every time I go out to eat, unless I go there often and know what I want (like the tuna melt pita and Greek fries at Pitaria. that's all I ever get there). So while I was a bit frustrated, I realized that it was Valentine's Day so the guy could be doing his best if it's been packed all day. So, we went ahead and ordered - Chicken & Pork Satay as an appetizer, I ordered Chicken Pad Thai (no peanuts), and Jonathan ordered the Red Curry with Chicken and a side of steamed rice. There were chicken, pork, and beef options for the satay, and while we ordered a chicken/pork combo, the plate we were served was all chicken. They were delicious though... marinated overnight in a slightly sweet and slightly sticky sauce. There was peanut sauce on the side, and chopped vegetables (cucumber, peppers, onions) in a light sauce as another side. 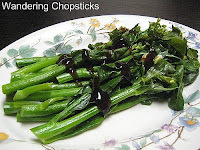 The vegetables were great with the satay (aka chicken on a stick), and Jonathan said it was a good peanut sauce. The only downfall was that they were brought out WITH the meal, instead of first (and the table behind us got their spring roll appetizer quite a bit sooner than their meals). Jonathan enjoyed his curry, noting that it was hotter than the pa-nang he had the last time we got Thai. The taste was too coconutty for me. I was very unimpressed with my pad thai, and will note it as the worst I have ever had (and I've gotten it fast-food style before!). First, the bean sprouts were very long and not mixed in. Second, besides the noodles, there were only a few green onions, a bunch of carrots, and a minuscule amount of (cubed and unflavored) chicken. I tried to make the most of it, but there were two other (big) problems. One, there were no chopsticks. Not one table in the restaurant had chopsticks! So, I had to eat with a fork, which I really hate to do for certain foods, pad thai included. Second, the wedge of lime was very small. Now, I usually ask for extra limes (I probably use the equivalent of a whole small lime if given the chance), so this isn't a big deal. BUT, when I asked the server for extra limes, he repeated "limes?" as if he didn't know what it was. So I pointed to the lime on my plate and reiterated my request. He seemed to understand.... but brought my back two LEMON SLICES instead of LIME WEDGES. Now, the funny part is that in many countries (like Bangladesh), the word for lemon and lime is the same, even though they have both fruits. But I pointed to a very GREEN lime, so I have no idea what happened. Anyway, I didn't eat very much of the meal, for the reasons all mentioned already. While our water was refilled regularly for the first half of dinner, we were ignored for a good twenty-five minutes when we were ready for the check. Eventually Jonathan had to get up and go request that our check be brought so we could pay and leave. Needless to say, we only gave a 10% tip. A group of us went for Chinese at Chef Liu. It was a super-cheap place to eat, and we had a ton of food. The potstickers were a little pricey, but were delicious. The beef chow mein was so-so. The scallion pancakes were fantastic and worth so much more than the cost. And the spicy wontons were a hit with everyone else, I just didn't particularly care for them. The dozen we had were gone in a flash. Their lunch specials also look wonderful, at just $5-7 a person. I imagine we'll be back, possibly again as a post-clubbing snack. The only downfalls: 1) our water was not refilled quickly enough, although they did come by a couple times without prompting. 2) there seemed to be two tables shooting off racial comments at one another and it escalated into shouting and fighting gestures. It was rather uncomfortable, as we were less than ten feet away, but the employees made one table leave (albeit the more innocent table). Oh, and they don't split checks, but that's not the end of the world, as it's a fairly common practice out here. We took the Caltrain and the BART into San Francisco this afternoon for the country's second-largest Chinese New Year Parade. We headed from the Powell Street Station to Chinatown to Union Square Park, figuring that would be an excellent place to watch the parade since it goes completely around it. But, the place is closed off tightly (and it wasn't when we came into town, so they must have cleared it out just a short while before), with policemen not letting anyone through. So we found a decent spot to stand. We were about 3 people in from the street, and it was only about 4pm (the parade did not begin until 5:30). Jonathan suggested that he try and get a reservation at one of the restaurants that are on the nearby roofs. He headed off to see what he could find out and I held our spots. Turns out that the wait for a patio seat at the Cheesecake Factory on the top of Macy*s was about an hour, which would seat us when the parade began. So, we took it and proceeded to wander Macy*s for about 45 minutes. We were seated at exactly 5:30, and our waiter (Joe) was kind enough to switch us from a center patio table to an edge table, so there was just a wall of glass between us and the world below. We also had the opportunity to dine exquisitely at a restaurant that we don't normally go to, as it's quite pricey in Florida. For some reason, the prices here were on-par with those of a Chili's. We had the Firecracker Salmon Rolls, which were spicy salmon rolled in spinach and dried in a wonton wrapper, served with a sweet chili sauce and cabbage (delicious sauce, the salmon was kinda overpriced otherwise). I had the Hot Turkey Supreme, which was humungous (I don't think I even ate half before having it boxed up). It was an open-faced sandwich served with fresh fries... it was brioche bread, turkey, spinach, tomato, and bacon, all covered in a white cheddar sauce. I loved it, and thought the cheddar cheese sauce was delicious. Jonathan had the Grilled Skirt Steak with mashed potatoes, corn, and onion strings. He quite enjoyed the steak (it was in a mushroom sauce, so I wasn't a big fan), and we both thought the mashed potatoes were amazing. The onion strings, notsomuch. We also had to splurge the $7 to share a slice of the Chocolate Tuxedo Cream Cheesecake. It was phenomenal: fudge cake, chocolate cheesecake, vanilla mascarpone mousse, and chocolate, with whipped cream and surrounded by chocolate and vanilla syrup piping. Jonathan's colleague from Cape Canaveral, Li, was out in Sunnyvale for a week with some LM employees, and we were able to get together for dinner. We headed out to Cupertino to go to Todai, a sushi buffet. It's a nice place for being in the Vallco mall, near Sears and the AMC movie theater. It's set up like a Golden Corral, with the buffet being mostly along a counter that spans the back of the restaurant. Aside from chicken teriyaki and some pork chops, almost every dish was seafood or sushi. There were some noodles and rice though. The sashimi only offered salmon and tuna, both of which were decent, but not the freshest/most flavorful. There were about twelve nigiri options, the ebi (shrimp) weren't the greatest, and the eel was not good. Tuna and salmon were good, and I believe Jonathan tried a few of the whitefishes without complaint. Now, there were probably twenty different rolls, ranging from your California to spicy tuna to a "fruity roll" which was crab with banana and kiwi. There was a spicy scallop salad roll, which tasted just like it sounds, and a chicken salad roll, which was a little like liver. None stick out too much in my mind, but that's okay since I chowed down on tuna sashimi. I also tried the Hawaiian Poke, but the tuna in that was too fatty to make up for the delicious marinade on the salad. The crispy calamari was among the most delicious I've ever had (and far more delectable than any I've tried off of a buffet), but the grilled calamari was rubbery - neither Jonathan nor I cared for it. The dessert options were plentiful. Chocolate and vanilla soft serve, creme brulee, cream puffs, three types of cheesecake, chocolate cake, pumpkin pie, butter cookies, sugar cookies, chocolate chip cookies, green tea cook, several gelatins, mango yogurt, and a few fruit tarts. Allegedly they have wonderful crepes, but we did not see any. The cookies were pretty bad (and hard), and the cake was a bit dry. Jonathan loved the creme brulee, and the cheesecakes would be enjoyed by those who like that particular pastry. This little balloon guy to the right was sitting on the cashier's counter. I thought he was cute, and the cashier made a joke about it being his boss. We were really planning on eating leftovers for dinner when Kathy asked us to join her for dinner, and I hadn't met Kathy yet, so we did that. We planned on eating at home for lunch today, but the new vehicle called out to us, wanting us to drive it around some and use the new features, so we took it to Jack in the Box, LoL.